Universitat Autònoma de Barcelona researchers and technicians at the company DAM will soon put into operation an experimental plant at the Rubí-Valldoreix wastewater treatment plant, with the objective of making the wastewater treatment process generate more energy than it consumes. Coordinated by professors Julián Carrera, Maria Eugenia Suárez, Julio Pérez and Francisco Javier Lafuente from the GENOCOV group of the UAB Department of Chemical, Biological and Environmental Engineering, and with the participation of Depuración de Aguas del Mediterráneo (DAM), the Catalan Water Agency (ACA) and the European Technology Platform for Water (WssTP), the SAVING-E project from the EU LIFE Programme aims to verify whether the wastewater treatment process can at the same time generate energy. The system was already tested in laboratory, at the UAB School of Engineering facilities, and will now be tested at large-scale on site at the Rubí-Valldoreix wastewater treatment plant. 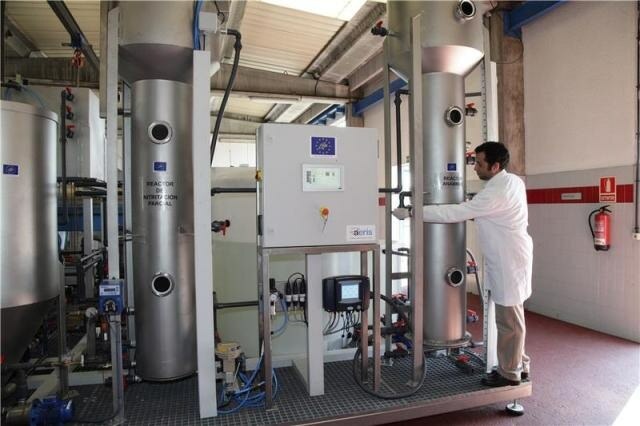 The total budget for the project LIFE14 ENV/ES/000633 – LIFE SAVING-E “Two-Stage Autotrophic N-remoVal for mainstream sewaGe trEatment” is €1,169,068, of which 58% is funded by the European Union. The aim of the project is to re-design wastewater treatment plants radically so that they can produce energy with no loss – or even with a gain – in performance. Present-day wastewater treatment plants require a minimum energy consumption of 8-15 kWh/inhabitant/year to meet the legal requirements on effluent discharge in terms of organic matter, nitrogen and phosphorus. This means considerable greenhouse gas emissions and high costs. Eliminating these costs would mean a saving of 500 to 1000 million Euros per year in EU countries. This new treatment plant will use all organic matter in the wastewater to produce biogas, a combustible gas made up principally of methane, which can be used to obtain heat and electricity. In addition, the nitrogen in the wastewater will be eliminated autotrophically, i.e. without the need for organic matter, by means of a new technology based on two biological stages: an aerobic partial-nitritation reactor and an anammox reactor. The pilot plant will contain a total of two cubic metres and will treat three cubic metres of wastewater a day. Compared with current urban wastewater treatment systems, researchers predict a reduction of 40% in total energy consumption, 10% in nitrogen compound disposal, 20% in greenhouse gases emission, and a 50% increase in biogas production. The first step, after the inauguration, will be to set the pilot plant into operation. This step will finalise during the first trimester of 2017. Following that, researchers hope to obtain the first experimental results at the end of 2017 and the definite validation at the end of 2018. The LIFE Programme is the European Union's only funding instrument devoted exclusively to the environment. Its general objective up to the year 2020 is to contribute to sustainable development and to the objectives of the Europe 2020 strategy, along with other important strategies on climate and the environment.